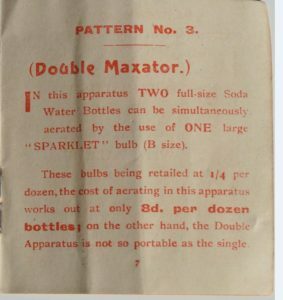 Detail: The Maxator System involves aerating liquid in a glass bottle which is contained within a metal outer case, presumably for safety reasons. The metal case twists to unlock it, and the top half lifts off to put the bottle inside. The system uses one ‘B’ size bulb. It is possible this was designed for travelling. 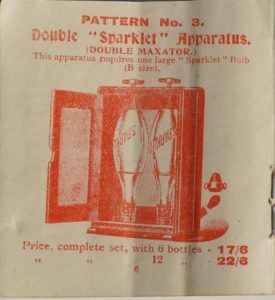 The pictures are from a 1902 catalogue. I have never seen a photo of this item. Notes: Please get in touch if you have one! !